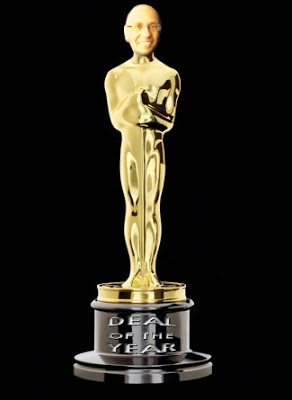 The IN VIVO Blog: And The Roger Goes To ... Our Deals of the Year Winners! And The Roger Goes To ... Our Deals of the Year Winners! To Claim Award: Ctrl-P, cut along border, tape to plaque (note: plaque not included). Congratulations to Amgen and Onyx, who've won, with more than 62% of the vote, our M&A of the Year nod. The voters chose the biggest deal -- though there were other interesting nominees we aren't surprised -- and we'll all be watching Kyprolis to see whether the price was right. This one was never in doubt. Celgene and Oncomed knew how to canvass, their Get Out The Vote strategy was clearly second to none (the alliance category tallied about 1000 more votes than the other categories). And even a late push from GSK/Community Care of North Carolina (no doubt helped by voters turning up to support GSK in its close race below) couldn't derail Celgene and Oncomed's cancer stem cell alliance from the top spot. It finished with about 63% of the vote. As of this morning the two leaders in this category -- Children's Hospital of Philadelphia funding Spark Therapeutics and GSK/Avalon -- were separated by only a few dozen votes out of thousands cast. Finally, a race worth watching 'til the end. Spark began to pull away, stretching its lead to a few percentage points with an hour to go. And then GSK/Avalon swung back, pipping them at the post in the waning moments of voting. GSK/Avalon 48%, Spark 47%. The achievement is even more impressive in light of the nature of the also-rans. Calico, Juno, and Editas were all noteworthy debuts in 2013. Ophthotech had possibly the best IPO in a crowded biotech IPO field. None of those four deals received more than a tiny sliver of the vote. As always our winners are welcome to make an acceptance speech in the form of a guest post here on In Vivo Blog. Winners, please reach out if you'd like to do so. Thanks everyone for voting again this year, and congratulations to our winners!